To nominate yourself or someone within your organization, please complete the judge’s nomination form at http://www.mobile-webaward.org/mwa/judges.asp. Mobile development professionals selected as judges will be contacted during the first week of April. Judging for the MobileWebAwards will take place in April, 2012, and winners will be notified by e-mail one week prior to the general announcement of winners in May, 2012. Judges will consist of a select group of Internet advertising professionals with an in-depth understanding of the current state-of-the-art in mobile website design and mobile application development. Past competition judges have included top executives from leading corporations, institutions and media organizations such as Ogilvy Interactive, R/GA , Saatchi & Saatchi, Blattner Brunner, Sun Microsystems, National Cable & Telecom Association, Refinery, Euro RSCG, A&E Television Networks , New York Post Interactive, The Cincinnati Enquirer, Ernst & Young , J. Walter Thompson, Xerox, Art Institute of Pittsburgh, and Aristotle. The Web Marketing Association is giving away a free Full conference Pass to Interactive Local Media East March 26-28 in Boston. BIA/Kelsey’s Interactive Local Media events are the number one place where “local” online and mobile executives get together. The industry standard since 1985, ILM remains the vital source for networking, innovation and practical takeways. Join us in Boston, March 26-28, for ILM East, where we’ll focus on channels, commerce and conversion – essential elements for winning in local. Go to our Contest Page to register to win. Deadline to enter is March 5, 2012. This month we are giving a way a full conference pass to one of the top Internet Marketing conferences of the year – SES Conference New York (formerly known as Search Engine Strategies)! To enter, simply submit your name on our new Facebook Contest page and one lucky participant will be selected to attend this outstanding conference compliments of the Web Marketing Association. Deadline for entry is March 1st. The Web Marketing Association is pleased to announce the Call For Entries for its first annual international MobileWebAward competition. This award program recognizes the individual and team achievements of Web professionals all over the world who create and maintain the best mobile Websites and the best mobile applications. The deadline for entry in the 2012 MobileWebAwards is March 30, 2012. The entry form and complete information can be found at www.mobile-webaward.org. The MobileWebAwards will be judged on seven criteria seen as requirements for a success mobile website or mobile app. They include Creativity, Impact, Design, Content, Interactivity, Ease of use and Use of the medium. Each mobile website or mobile app entry is judged against other entries of the same format in its industry category and then against an overall standard of excellence. •	A “Best of Industry” MobileWebAward will be given in each of the 96 industry categories, including financial services, medical, small business, travel, advertising, transportation and government. •	The competition’s highest honor, the 2012 MobileWebAward “Best of Show,” will be given to the one best mobile website and one best mobile app that the judges believe represents the pinnacle of outstanding achievement in Web development. •	The Web Marketing Association will also recognize the interactive agency winning the most awards in the competition with the “Top Interactive Agency” WebAward. •	Each organization that wins 5 or more MobileWebAwards will be awarded an Outstanding Mobile Interactive Developer trophy. Since 1997, the WebAwards have helped define the standards for website development, now the MobileWebAwards will do the same for sites and apps designed for mobile devices. Smartphones and tablet computers are exploding and companies are racing to be allow users to connect and interact with them using mobile devices. The goal of the MobileWebAwards is to both recognize the people and organizations responsible for developing some of the most effective mobile Web sites and mobile apps on the Internet. The Best of Industry winners statue is reminiscent of a personal digital device, it could be yesterday’s smart phone, today’s tablet, or tomorrow’s device. It is crafted of fine jet black crystal with the iconic “W” accent in 24kt plated gold and personalized with your award information. The award is entirely hand crafted by, Society Awards, the makers and designers of other notable award programs such as the Golden Globes, Emmys, MTV VMAs, and CLIOs to name a few, and presented in its own custom gift box. 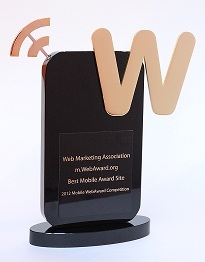 Judging for the 2012 MobileWebAwards will take place in April and winners are expected to be announced in late May. Judges will consist of a select group of Internet professionals who have direct experience designing and managing mobile Websites,–including members of the media, interactive creative directors, site designers, content providers and webmasters – with an in-depth understanding of the current state-of-the-art in Web site development and technology. Past WebAward judges have included top executives from leading organizations such as A&E Television Networks, Agency.com, BGT Partners, Worldwide, The Cincinnati Enquirer, Comedy Central, Disney, Euro RSCG, Ion Global, J. Walter Thompson, John Deere Company, New York Post Interactive, Organic, Inc., Refinery, R/GA, Saatchi & Saatchi, SAP, Starwood Hotels, Sun Microsystems, Warner Bros. Online, Xerox and Website Magazine. Check out our Web Marketing Association Facebook Page and be sure to like us as we will be providing hints and tips on how to improve your chances on winning a top award though out March. The 2012 MobileWebAwards are sponsored by the following leading organizations: BGT Partners, PR Newswire, Burst Media, MycroBurst, EContent Magazine, ExactTarget, ad:tech conferences, Internet World UK, SES Conferences, Webmaster Radio, and Website Magazine. The Web Marketing Association thanks these companies for their commitment to the entire online marketing community. The deadline to enter the Web Marketing Association’s 10th annual Internet Advertising Competition has been extended to Feb 15th to allow current entries to be completed and new entries to be added. After that date, access to the nominator accounts will be closed and the judging phase will begin.